I've been making pottery at the Made in Jerome Pottery shop in Jerome, AZ since 1980, after having apprenticed with the owner, David Hall, who started the shop with several other potters in 1972. 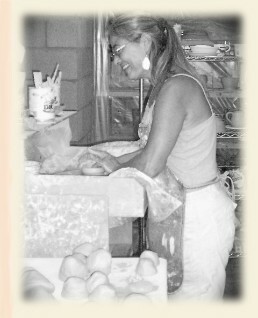 There we do a traditional style of stoneware using a local clay that is hand dug nearby and processed in the shop. It is earthy and functional reduction fired ware. Some 20 years later, I decided to create a studio in my home where I could experiment with different clays and glazes, and so since 2001 I have been doing my own line of pottery in addition to working at Made in Jerome. 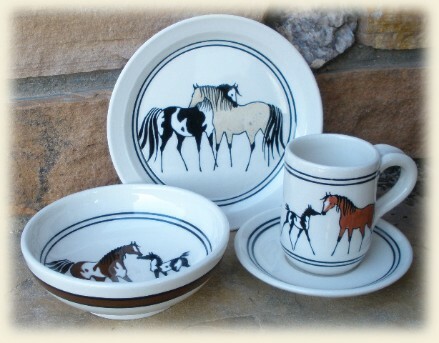 I make various types of pottery including, but not limited to: plates, jars, bowls, mugs, planters, chip & dip sets, tumblers, toothpick holders, and utensil holders. I use white stoneware, red stoneware and porcelain clays that are all high fired, functional ware that can be put in the dishwasher and microwave. All the pottery is durable and lead-free/ food-safe.